RENEW-NPA Team Leader Le Xuan Tung checks five items of Chinese made 82mm mortar rounds found inside the mechanical workshop. Hai Khe, Hai Lang, Quang Tri. 14 August 2017. Hien Xuan Ngo / Project RENEW-NPA. A mechanic narrowly escaped serious injury from a mortar fragment in an explosion at his workshop on Sunday. The explosion, which occurred around 4:30 p.m., shook the entire coastal village of Trung An in Hai Khe Village, Hai Lang District. The site is about 50km south of the former DMZ. 31-year-old Tran Trung Hau was recklessly welding small steel hooks to mortar rounds that had been brought in by a neighbor who had used these dangerous munitions as fishing sinkers. He had asked if these munitions were safe and the customer insisted that they contained no explosive. When mechanic Hau was working on the fourth mortar, it exploded. Fragments breached sheets of cement that made up the workshop’s roof, but fortunately Hau was turned away from the immediate blast and only suffered minor injuries. A Y-shape steel supporting shelf had blocked him from the impact. A big piece of shrapnel was found about 100 meters from the workshop, according to local police. Fortunately, Hau only had slight scratches to his leg and he was temporarily blinded from gunpowder in his eyes. He was immediately taken to the provincial hospital for examination and later was allowed to go home. Doctors said that he would need two weeks for his eyes to recover. A Military Officer based at Hai Khe called Project RENEW-NPA to report the accident and to ask for support. Local authorities including Hai Lang District police and My Thuy Coast Guards sealed off the workshop to prevent neighbors from coming closer to the hazard. On Monday, Project RENEW-NPA mobile EOD Team No. 1 arrived in Trung An Village and followed local police and military personnel to the accident scene. Inside the workshop the team found five items of Chinese made 82mm mortar rounds. Bolts and steel hooks were attached to some, indicating that they had been used as fishing sinkers for many years. Five Chinese made 82mm mortar rounds with bolts and hooks on their casings indicate they have been used as fishing sinkers for many years. Hai Khe, Hai Lang, Quang Tri. 14 August 2017. Hien Xuan Ngo / Project RENEW-NPA. RENEW-NPA EOD team has transported the five mortars to the central demolition site for disposal later. Tran Nhan Hau has been running his mechanical shop for two years, since returning from four years of working in Korea. His wife is pregnant and they are expecting their first child next month. The accident has shocked the father-to-be and he is unsure whether he will resume working in the workshop. 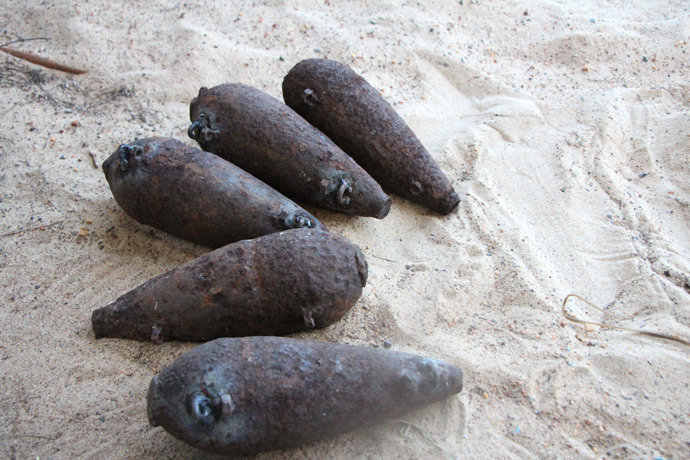 According to a Coast Guard representative, people making a living at fishing along the coast in Hai Lang sometimes still use wartime munitions as fishing sinkers. This accident marked the first casualty caused by unexploded ordnance in Quang Tri Province in 2017. 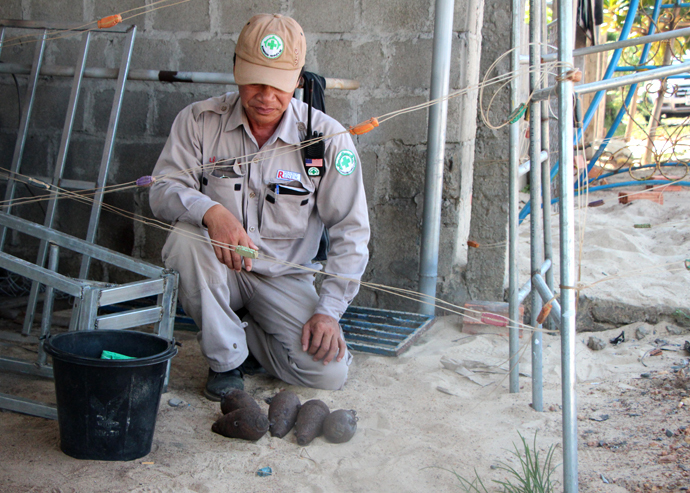 Nguyen Hieu Trung, Coordination Manager of Project RENEW, said that EOD teams and other RENEW-NPA staff were hoping this might be the first year since the war that Quang Tri Province could record zero accidents in an entire year. Trung said there are pockets of activity that RENEW staff don’t always know about, where dangerous practices could cause death, injury, destruction of homes and other property. “We have to take the RENEW safety message into all of these places, to warn people of the danger and to discourage them from harmful activities,” he said.